Equities have been sideways now for the last 4-5 days, showing little to no progress in SPX, as this index along with NASDAQ Composite and the DJIA have not yet joined the NASDAQ 100 back at new high territory. Yesterday's main technical development concerned the breakout in WTI Crude oil which looks to help Crude make further progress. Energy stocks responded and were Monday's best performing sector and look likely to benefit a bit more from this Crude surge in the near-term. However, this sector has performed largely in-line with SPX, higher by 19.57% and Energy as a group has underperformed other sectors like Technology, Industrials, Discretionary, and Communication Services. While Exploration and Production stocks look attractive, others within Oil Services and Integrated oils have underperformed dramatically, making selectivity important. Meanwhile, REITS took another leg down, and IYR, VNQ underperformed as STIC, RLGY, RHP, CLNY, WRI, SKT, MAC, REG, KIM were all down 2.5% or more. This latter group still looks likely to weaken further in the days and weeks ahead, and investors should hold off from trying to buy dips. Overall, a more difficult tape near-term with a few signs in the last week of short-term breadth having dropped off a bit, and groups like Healthcare are primarily responsible, proving to be a definite drag on broader market performance given their 13.3% weighting in the SPX. However, until there is evidence of SPX dropping down under 2877 on a close, markets still have the chance of pushing higher, and some type of proof of weakness will be necessary to avoid. S&P's plodding along continues, which has been a source of frustration for both bulls and bears alike. For those newly involved, S&P has not yet broken out to new highs such as what's happened to the NDX. The hourly pattern here remains choppy and despite being upward sloping, a break down under last week's lows of 2889 in S&P Futures or 2893 would likely prove negative to Equities in the near-term. We'll use 2877 as being the key area to stop out trading longs, while movement back above 2915.75 should allow for a final push up to 2945-50 area, where this should stall out into early May. For now, insufficient reasons from a price standpoint to be too negative, but some upward acceleration here in both prices and breadth/momentum would be a source of comfort to bulls, as markets have been churning with no change of trend for the last 4-5 trading days. Energy has begun to show a few signs of life in the last couple weeks, but it was Crude's breakout of the 8 day range in both WTI and Brent which helped XOP on Monday. This Exploration and Production ETF looks likely to follow through higher up to 34.50 in the short run. Energy has not really shown much outperformance to the broader market despite Crude's sharp rally in recent months. However, with regards to XOP, this does seem likely to gain some momentum after the technical breakout of this base which had been in place since January of this year. A breakout of this consolidation range should bode well for some strength out of XOP, and this ETF is favored over both OIH and XLE for outperformance within Energy. REITS have begun to trend down very sharply in recent days and further underperformance out of this group looks likely. The VNQ, the Vanguard Real Estate ETF, when plotted vs SPX, has broken down under the lows of this triangle pattern it had formed back in December 2018. While stretched after the last couple days of losses, no evidence of this bottoming here is in place. Thus, additional pullbacks and underperformance for the group as a whole is expected in the days/weeks ahead. SPX - (3-5 Days)- Bullish barring a break of 2900- Gradual waning, which is largely Healthcare related, but Tech, Financials and Industrials are all still positive and ETF's of these sectors have moved to new highs for 2019 and in the case for XLK and XLY, new all-time highs. Above 2915 is bullish for a move up to 2945-9. Under 2877 important for the bear case. Looking back at last week, we saw some promising developments with XLY, XLK pushing back to new high territory while XLI moved back to new 2019 highs. The NASDAQ 100 actually pushed up and made a new all-time closing high while DJIA, CCMP & SPX are promising in this regard that new highs can likely happen sometime this year. Healthcare has been the big laggard in recent weeks, showing a rather capitulatory decline and indeed important at 13.3% the second largest sector for SPX. For now though, the strength in sectors like Industrials and Financials have helped to bail out Technology, which itself has not been all that weak of late. Overall, insufficient weakness this past week to be all that negative heading into late April from a price perspective, but sentiment is sounding a clear warning now in getting very optimistic and something to watch carefully. Outside of equities, the commodities rally has proven difficult to trust given the US Dollar strength, which managed to build last week (and will be highlighted briefly below) Meanwhile, Treasury yields attempted a brief bounce last week, but yet held exactly where they needed to (on US 10YR ) before softening on Wed/Thursday. The Yield curve meanwhile has shown little to no real evidence of breaking the neutral consolidation that has been in place most of this year. I'll list a couple European indices with brief comments and then the US Dollar chart which is growing increasingly stronger in recent days. Have a nice holiday weekend, and my technical coverage will resume with the Weekly Technical Perspective on Monday morning. SX5E, the STOXX50, is important to highlight given that Europe has moved up at a slightly quicker rate than US lately. Its breakout a couple months ago of the larger downtrend was seen as constructive, technically, and after a few weeks of consolidation, started to turn back higher sharply. Near-term this remains quite bullish with not much resistance until near 3600. Therefore, this remains a tough index to fade on gains right now, and Europe, similar to the US, is still quite bullish technically, with little to no real technical damage since it bottomed last December. The DAX, or German Boerse, has made remarkable progress lately in getting back up above not only former lows like the SPX and other US indices have, but also in now exceeding the larger downtrend from the highs made in early 2018. This is a very positive near-term development. So, despite being near-term overbought, the pattern has gotten structurally better for DAX technically and should be able to carry this higher to 12750-13000 without too much trouble. The Dollar should be on the verge of a larger move given the constricted trading in recent months, and given the downward bias of the 8 year cycle from 2016 highs, i had thought this would start to trend lower. Well the near-term technicals have actually been quite bullish for USD lately, so it's important not to get too negative too soon and let this move play out. Any rally above March highs that takes out this intermediate-term trend will let this pattern push higher into the Summer, which could be near-term damaging for EM , China and commodities before a larger bottom. Note : No Weekly call or daily videos this week, as I am travelling out of the country. Normal service will resume next week. Thanks for your understanding. The two big themes for yesterday's trading revolved around both the ongoing decline in Healthcare, which began to exhibit capitulatory type selling, as well as the advance in Transports, which partially offset, but enough to keep indices largely unchanged, with just small losses by the close. Rails helped Transports as well as Industrials (shown below) which have moved to new highs for the year. Healthcare accounts for over 13.3% of the SPX, so certainly important as the second largest sector behind Technology. The breakdown in stocks like ALXN, DVA, VRTX, EW, REGN, ISRG, NKTR has been extreme, and each of these stocks was down more than 6% on Wednesday alone. Charts on XLV (shown below) looks to be in a capitulatory type decline and still early for any type of meaningful bottom. Any bounce Thursday/Friday should still be a selling opportunity for a bit more weakness into early next week. Overall, it's important to note that the 3 big sectors which had accounted for most of the performance thus far this year, Technology, Industirals and Discretionary, have now all moved up above former highs, with Tech and Discretionary moving back to new all-time highs, while Industrials has hit new highs for 2019. These are all temporary positive developments. Upon closer look, the long-term momentum decline has certainly weighed on these sectors, and we'll dig into this a bit deeper in the weekly piece next Monday morning. For now, seeing some type of stabilization in Healthcare will be important for the market, but Tech , Industrials and Financials are perfectly able to carry prices higher near-term a bit longer. Industrials have managed to power higher over both prior highs thought to be important. Rails have been primarily responsible, but definitely a very bullish move that argues for further gains in the days/weeks ahead with targets near last Fall's highs. Industrials have now moved back to new highs for the year, while both XLK and XLY have moved to new all-time highs. While momentum has certainly not followed on a long-term basis given the extent of 4Q deterioration, this is a short-term positive. Stocks like UNP, CSX, NSC, KSU have all shown excellent near-term structure and moved higher. Healthcare, as seen by the SPDR ETF, XLV, broke down exactly opposite of what most symmetrical triangles following lengthy uptrends produce. In this case, a violation of the lower level, which has led to rapid acceleration lower in the last couple days. Given the momentum of this move, it's difficult to call for a bottom here, despite prices reaching oversold territory quickly. Bounces could still represent selling opportunities into next week before any bottom is at hand. Any decline down to 82-83 should represent an excellent risk/reward opportunity to buy dips. Copper is showing some real strength at the time as Treasury yields have also begun to pop. While this "forward looking" economic gauge has been strengthening, most economic data continues to miss expectations. Near-term though, this move is a positive for Copper and should drive the metal higher up to 308-310. Thursday Webinar today will take place at 11 am EST- Unfortunately i will not be able to do this at 1pm today, so we're scheduling this earlier. Apologies if that doesn't work, but i will have a link that i will post afterwards to the Blog at http://newtonadvisor.com/blog and to YouTube on my channel. See me for details if you cannot locate. SPX - (3-5 Days)- Bearish- Reversal failed to lead to followthrough yet, but prices now back up to former highs near 2890 and should make it hard to push higher. Resistance at 2900-5 while Stocks likely begin 3-5 day pullback. Maximum weakness down to 2785-2800 in all likelihood. Early losses failed to hold, and prices wound up back near prior highs, with little to no damage having been done. Is this the end of the correction? We'll see.. as of now, we still have 3 very important sectors right up at resistance, while breadth and momentum have dropped off sharply. While Technology managed to lead in trading, and was the only sector along with REITS up more than 0.50%. As discussed, S&P prices are now back up to prior highs though with far less momentum and the area at 2895-2905 (if what im thinking is correct) should still be important as resistance and hold prices. ON the other hand, it's always good to know where one's wrong, and if XLY, XLI and XLK all manage to get through prior highs with little to no problems, than the rally might be able to persist a bit longer. After all, the uptrend for SPX, DJIA and NASDAQ had NOT been broken yet, but only with IWM along with some concerning problems with breadth and momentum in the very short term. So it seemed like a good spot to take a stab given some of the warning signs previously discussed, and this largely has not changed with Wednesday's trading. After nearly 3 months of being bullish, it's all about picking spots, and this continues to look appealing to me technically as a place to lighten up for at least a minor move. Outside of equities, the real action occurred in the US Dollar and Treasury yields which both fell sharply, helping to boost commodities. Given that both fell to new multi-day lows, the decline looks to continue, and should result in CCI index breaking out to new monthly highs and Precious metals to show some real outperformance. SPX managed to push back to the highs of the last couple days, though momentum remains well off highs and as seen in RSI on hourly charts, has steadily moved lower. While a move to 2900-5 can't be ruled out, this still looks like an appealing area to take off risk, not bet on further upside. The key area to breach to have more confidence lies near 2877-8. Under those lows gives some more confidence of a peak in place that should allow for at least 3-5 days of downside. CCI, the Equal-weighted Thomson Reuters Commodity index, has pushed back up to recent highs, and looks likely to result in this pushing higher in the days and weeks ahead. Given that both the US Dollar and Yields are declining, this should prove beneficial for commodities. Chinese stocks could weaken near-term, and it's right for those short-term focused to consider taking profits and holding off from initiating new longs here right away after this recent rally. Overall the China Large-Cap ETF, FXI, looks bearish near-term given its recent reversal and further near-term weakness looks likely before this can start moving higher again. In recent days, FXI rolled over in recent days to get back below the area of the prior breakout. This close at multi-day lows likely results in FXI puling back under 45 in the days ahead , which could offer a better risk/reward opportunity on the long side. While the intermediate-term rally is very much intact, the near-term has stalled and might allow for some near-term weakness before this can turn back higher. SPX - (3-5 Days)- Bearish- Reversal happened on cue- Stocks likely begin 3-5 day pullback. Maximum weakness down to 2785-2800 in all likelihood. Simply stated, Tuesday's price action was exactly what needed to happen to have some confidence of markets peaking out in the short run. We saw many indices close down at the lowest level in four days after having recorded upside exhaustion, Breadth confirmed with 3/1 bearish breadth and even heavier volume into Down v Up stocks, the Russell 2000 broke its uptrend, and 3 key sectors stalled out near prior highs: Technology, Industrials and Consumer Discretionary before turning down to make new multi-day lows. Given that these last three groups are this current year's Leading sectors in terms of performance, we look to finally be at a spot where at least near-term weakness can occur and a short-term pullback could be underway. It's right to be defensive over the next 3-5 days, adopting hedging techniques and/or holding off on buying dips right away. Outside of Equities the larger move of interest happened in Gold. We saw Gold turn back higher to multi-day highs after what looks to have been a successful retest of March lows. Given the Dollar starting to top out, it looks likely that Gold turns higher, as US 10-Year Treasury yields remain under pressure. SPX rolled over yesterday to a multi-day low close. While trendlines have not yet been broken, and some might question turning bearish ahead of this development, the combination of Sectors stalling out near key levels while counter-trend sells are present on the heels of the recent stallout in breadth and momentum makes sense to adopt a defensive posture for at least a near-temr pullback. It's thought that weakness likely does not undercut 2785, so pullbacks over the next week should represent buying opportunities. Russell 2000 and Small-caps should continue to be avoided near-term, as the break of the near-term uptrend should make IWM weaker than the market in the days to come. While SPX did not yet break its uptrend, IWM did in fact violate this trend. Thus, near-term, one can make the case for pullbacks down to $151 from its current $155.20, which could happen into next week. Thus for the Russell, yesterday's break definitely was more bearish than bullish and signals a good likelihood of further weakness. Gold looks to have started a move back higher as its recent pullback attempt held above March lows and now the last few days have moved up meaningfully off the lows to multi-day highs. This is constructive technically and the breakout back above 1315 would be a further step in the right direction with movement back above 1325 leading to a more meaningful test of the all-important 1360-75 area. For now, given that the Equity market looks to be stalling out after nearly the best rally in over 16 months, spanning eight consecutive days higher, one might consider diversifying into Gold and/or commodities in general, and should put Gold on the "Front Burner" so to speak as something to watch carefully in the days ahead in the event we see even further follow-through. Fractional gains yet again for yesterday, and yet again, indices look to successfully battled back to close the day having erased the earlier loss. Breadth however barely finished positive and five sectors were down on the day. Specifically for Tuesday/Wednesday, it looks to be problematic that XLY is now right at the level of last Octobers highs while showing evidence of counter-trend exhaustion in this trend. Additionally, Industrials also looks to be stalling out near February's highs and has similar exhaustion, which last time proved to be problematic for this group in late February. Technology has seen some real ability of the FAANG group to play catchup of late, FB, AAPL, AMZN, NFLX, GOOGL, yet XLI looks to have its own level of resistance near last Fall's highs while also showing a similar pattern of counter-trend exhaustion. Thus, overall the problem certainly isn't with the trend, but yet with the plethora of exhaustion signals now being seen on the benchmark indices on daily charts along with many of the sectors that have led this market over the first three months of this year. Breadth has now begun to slow a bit, and momentum has not been as strong over the last week. All of these reasons are grounds to consider buying implied volatility in the near-term, and/or considering lightening up in some of the stocks which have now reached prior highs similar to the indices themselves. While the intermediate-term trend still looks quite strong from December 2018 lows and not vulnerable to a large correction, the near-term has given a few hints of cautionary signs for those that are watching and might cause this bullish seasonal month of April to be a bit tougher than many expect to continue straight higher. Outside of Equities, commodities seem to have suddenly taken charge in the last month, despite the Dollar not having really turned lower materially just yet. Some of the precious metals have rallied, while Energy certainly has been a bright spot. Cattle and Lean Hogs have fared well along with Cotton, and rallies in Coffee (if momentum is any guide) seem to be right around the corner. What's particularly bullish however looks to be what's happened to Natural Gas in the last 24 hours as prices have rallied sharply to break the downtrend over the last month after having hit good support. This move looks to extend in the weeks ahead, and pullbacks could be utilized to give this a closer look as a long, given forecasts of potentially a cooler back half of April. NDX has gotten right back to prior highs, a level which likely will cause some stalling out this week as this represents strong resistance to the advance. The area from 7600 to 7750 should be thought of something to consider selling into initially as prices near this level. Upon any sort of pullback to this uptrend, that's likely the extent of the selling, at least for the month of April. Commodities look to be turning higher, regardless of any strong downward pressure in the US Dollar. The last two weeks have seen consistent gains in the Invesco DB Commodity Index tracking fund (DBC) which has helped this reach the highest levels since last November. Trends remain bullish, and this should be an area to consider diversifying into, as this uptrend should begin to accelerate as the Dollar's drop starts to gain speed. Natural Gas surge yesterday makes UNG attractive to consider as a technical long, as June Nat Gas likely goes from 2.70 back to 2.90 in the short run. After having held a key area of support that held four times since last September, this managed to gain ground to multi-day highs yesterday, rising back up above 2.70. UNG, the ETF for Natural gas (non-levered) looks to be a good bet to rise to $25 in the short run, and longs are favored for follow-through in the days and weeks ahead. Some minor evidence of stallout Tuesday and by day's end, SPX had largely finished unchanged, while NASDAQ was higher by 0.25% and DJIA was fractionally lower. Breadth came in Negative ever so slightly and around half the sectors finished down, led by Consumer Staples and Energy, despite the late surge by WTI Crude. All in all, not a convincing reversal sign for indices, but yet seeing some negative breadth towards the end of rallies typically will be important to monitor over these next couple days. Overall, to have real faith in a reversal, ideally we'll need to see an early rally attempt that fails and moves to new multi-day lows. (At present we've seen four straight days where the open, high, low and close were all higher) The minor pullback we saw from 3/21 into 3/27 failed to do much damage and held the trendline from December lows. Getting below this swing low which hits this trend would involve a close down UNDER 2785, or around 80 points lower. Thus, a minor pullback is possible that doesn't make much progress lower and then pushes higher. Yet, at this stage of the rally with the start of breadth stalling while Technology reaches resistance, we have more evidence that a pullback, even if minor, should be right around the corner. Two groups could come to the rescue to bail out Technology and buoy the market during the month of April. Transports are one of these which had lagged badly in the last month, but which have come to life recently, with Rails breaking back out to new highs (see CSX, NSC, KSU, UNP) Even the Airlines have managed a bounce, within their respective bearish pattern. The second is Healthcare, which is looking increasingly interesting as a long. Biotech ETF (XBI) along with the Healthcare ETF (XLV) both show triangle patterns where prices are now testing the upper part of this boundary which has already been tested before (and in my thinking, should finally lead to a breakout in this group) Overall, both of these latter sectors are attractive and can be considered substitutes for those wishing to exit Technology in the next 1-2 days. S&P has now pushed higher off its trend from December for four straight sessions, with SPX cash index recording exhaustion, while Futures contracts for June show these to be two days away. Meanwhile momentum has made a pattern of lower highs than either of the two recent peaks. Bottom line, the trend remains positive and for now, no evidence of any reversal. Thus, a bit more strength looks possible with targets at 2880-5 for SPX cash. If Transports and Healthcare can both follow through on recent strength, this would be seen as a big positive at a time when Tech is thought to face major resistance and likely stall out by next week. To have real confidence in any pullback, prices will need to get down under 2785, which represents the uptrend line and last swing low. Until that time the trend is bullish, but one should look to sell into strength over the next 2-3 days. Transportation stocks have been the number 1 performing SPX GICS Level 2 group in the past week, showing +6% performance out of 24 groups. The DJ Transportation Avg, shown above, has now officially begun to play catch-up, and technically has just exceeded the entire downtrend from September, something that most market indices accomplished around two months ago. Near-term, while February highs could represent some minor resistance, this breakout is worth highlighting and should lead to outperformance in the weeks and months ahead. Rail stocks in particular are the most attractive part of this group, and stocks like CSX, UNP, KSU, and NSC have all shown recent breakouts that make this area worth highlighting. Healthcare now is on the verge of breaking out after nearly a full month of sideways trading. This sector lagged throughout the month of March, but now is well positioned to move higher after pushing up to test the upside border of this Triangle which has been intact for the last couple months. Patterns look similar in both XLV and also XBI and favor being long after already one successful test, thinking that the second retest won't hold, and we'll see a breakout of this pattern. Overall, it looks right to favor Healthcare for a bounce this month and to play catchup after having lagged this last month. Technically, this sector remains good structurally but just looks to have consolidated, which has helped to alleviate overbought conditions. SPX - (3-5 Days)- Bullish- Quad-week seasonality continues to suggest higher prices into early next week and both Tech and Financials are still showing strength. Rallies over 2821 should reach 2830-5. Buy dips at 2808-10. Tough to read too much into Thursday's stalling out. S&P had managed to exceed March highs on a closing and intra-day basis Wednesday, while the NASDAQ remains elevated above its upper 2% Standard Deviation Bollinger band, though both still quite bullish in the short run. This stalling didn't produce any real decline in the sectors that truly matter for this market, that being Technology and Financials (34.11% combined in SPX) The only sector giving up more than -0.50% was Materials which accounts for just 2.66% of SPX. Overall, with no evidence of prior days lows being broken and Technology's run continuing, its right to still favor further gains. As discussed in recent days, the "FAANG" stocks such as FB, AAPL, AMZN, NFLX, GOOGL, are likely to make further progress despite some of the bad news hurting FB Thursday early on. Interestingly enough, two sectors thought to be important to markets continuing higher have begun to outperform in the rolling 5 days: Financials and Healthcare. The latter was discussed yesterday morning with Services stocks bouncing, and below we'll take a look at Financials. Outside of stocks, Treasury yields remain pointed lower, The Dollar has attempted to rally, while Crude oil remains pointed higher towards $61-$63 and Gold looks to be turning back lower for at least a mild correction. Charts of Pound Sterling remain constructive near-term, while the EURUSD bounce looks fadeable for a pullback down to 1.115. Overall with regards to risk assets, still not too much troublesome in the near-term, and it still looks likely that stocks push higher into end of month. S&P likely to turn higher Friday after just a minor blip in yesterday's trading. As daily charts show, after having made new intra-day and closing highs on Wednesday, yesterday's minor weakness which failed to even take out prior lows shouldn't be paid too much attention. Seasonal trends tend to favor strength through Quad-witching followed by potentially a down week next week. For now, not too much to suggest "down" just yet, so we'll still lean long, expecting a push back to new highs for the week. Those who utilize counter-trend signals like Demark's exhaustion indicators TD Sequential and TD Combo see that stocks like AAPL currently have an 11 count out of a possible 13, indicating that further strength is likely in this before it fades. Near-term targets should lie near the 50% retracement of this decline, or 187.83, with not much standing in the way of prices pushing up a bit more into next week. Given the % weightings in many indices and sectors, this alone might serve as a tailwind for stocks until early next week. Don't look now, but Financials have stabilized in recent days and have begun to outperform in the last 5 trading sessions, showing outperformance to the broader market, as XLF has begun to push higher. Following the last month of weakness within Financials, this group looks to be slowly but surely trying to bottom out. Relative charts of XLF to SPX show counter-trend BUYs now in place using TD Sequential, the same indicator that suggested this group might be on the verge of weakening in late January. Overall, when groups like Financials start to play catchup, it's still worth holding longs, as Technology and Financials together represnet over 1/3 of the SPX. Overall this is one factor that is a clear "arrow in the quiver" for Bulls that could keep the rally going a bit longer than most expect. SPX - (3-5 Days)- Bullish- No change- Am expecting a test of March highs into next week before any stallout- The act of getting back above prior week's lows at 2767-72 along with surpassing trendline resistance should produce a lift to test and exceed March highs. Breadth proved to be far stronger yesterday on the upside than any of the down days last week. EuroSTOXX 50- Minor bullish on Monday's rebound- Gains to 3350 look possible, with movement up over 3375 needed to create meaningful strength. Tuesday's ability to close up 0.30-0.50% on the day still make gains more likely over the next few days, vs Declines. For the second straight day we witnessed some decent Tech strength, which proved broad-based in showing strength out of the Semiconductors, Tech Hardware, and Software. Many of the "FAANG" stocks extended breakouts, with stocks like GOOGL and AAPL pushing higher as the NY Fang index broke out above the entire downtrend since last Summer. Energy snapped back along with Healthcare while Industrials lagged again, with Boeing (BA) proving to be a heavy weight on the index. Breadth came in only fractionally positive at less than 3/2 bullish, but yet seeing Technology provide some meaningful strength was thought to be a positive for the market at a time when many still doubt the longevity of this rally. Long TLT- Expect a push up to 124 initially and potentially higher, but the breakdown in yields looks to continue throughout the balance of this week and potentially next, and it looks premature to fade. NASDAQ still trending higher vs SPX which is bullish- The NASDAQ has turned back higher to new monthly highs vs SPX in the last couple days, something which bodes well for this rally to continue a bit higher before stalling out. Normally before broad-based market weakness occurs, it's been typical to see the NASDAQ start to stall out and weaken relatively speaking to the rest of the market. Yet now, we're seeing precisely the opposite with NASDAQ pushing up to new highs vs SPX to the highest levels seen since last October. Counter-trend signs of exhaustion on this lift are premature and bode well for further relative outperformance in NASDAQ v SPX. The breakdown in Treasury yields looks to extend in the near-term, with the support violation in US 10-Year Treasury note yields likely to send yields down to test early year lows near 2.545 without too much trouble. Only a move back up above 2.67% would suggest this could be a fake move. For now, additional Treasury strength is likely (yield weakness) which might keep Financials under a bit more pressure in the next 2-3 days before this group can stabilize and turn back higher. Utilities "breakout" does look to extend near-term, and as written in this week's Weekly Technical Perspective 3/10, is something to consider overweighting into April. However, it's important to reiterate that the weekly and monthly charts look far different than Daily, and suggest selling into this move is right once XLU reaches 60, and when VNQ reaches 86 for the REITS. While rates moving lower should be bullish for these groups, the long-term channel resistance lines are likely to result in far stronger resistance than recent December highs which were just broken, and suggest taking profits/fading these Yield sensitve groups makes sense in the weeks ahead on further strength. SPX - (3-5 Days)- Bullish- The act of getting back above prior week's lows at 2767-72 along with surpassing trendline resistance should produce a lift to test and exceed March highs. Breadth proved to be far stronger yesterday on the upside than any of the down days last week. Monday's sharp rebound was sufficient to think that a rally is now underway which should exceed March highs, pushing higher into late March/early April before any stalling out. (and could potentially challenge last Fall's highs) Breadth expanded substantially on yesterday's move to nearly 4/1 bullish, and we saw both Technology and Financials gain ground by at least 1%. In total, 8 sectors out of 11 were up 1%+ on the session, and we saw important rebounds in both Semiconductor and Retail stocks, which had been under serious pressure in the last week. Overall, the act of getting back up OVER 2772 for S&P Futures and above 2767.66 in SPX cash along with NDX-7073, NASDAQ Comp 7501, is thought to be a very bullish development. S&P exceeded the downtrend from last week, and did so on a very encouraging move in Technology, with the so-called "FAANG" stocks like AAPL, FB and GOOGL all making meaningfully positive breakouts in Monday's trading. It was thought that technically the trend was bearish until 2772 could be surpassed, and that happened yesterday. Prices had neared the lower Bollinger band (2% Std Dev) and yesterday's breadth was far more positive on the upside than any of the negative days seen last week. Sentiment wise, we'd seen a contraction in bullish sentiment on just a minimal pullback, something which was thought to limit any further drawdown. Thus, while it was thought that a correction could be upon us last week, it appears to have been incredibly short-lived for now and has gotten back up above areas that alleviate short-term concern. S&P- Further gains likely to exceed March highs - S&P rally yesterday accomplished two positive things technically. Prices moved back up above 2772 which had marked last Monday's lows. Additionally, prices broke out above the minor downtrend in place since last week. This is thought to allow for a further rally to challenge and surpass March highs. While momentum remains negatively sloped on daily charts, it's positive on a weekly basis, and we've seen a breakout in the popular FANG group which has a heavy weighting in Technology and Discretionary. It's thought that yesterday's move might lead to a rally into late March/early April before a peak. Technology's "FAANG" group should rally further in the days/weeks ahead- NY FANG index on Daily charts managed to completely reverse the breakdown seen last week. Furthermore, prices exceeded the downtrend which has been in place since early last year. This looks to be important and positive (often the false moves can produce bigger snapback rallies than the breakouts themselves, as short-covering and technical buying starts to chase the breakouts ) Overall, stocks like FB, AAPL and GOOGL all look to have broken out above meaningful resistance yesterday, while AMZN, NFLX are well positioned for such a move, but still basing at this time. Overweights look prudent given the degree of the consolidation since last year which now looks to have led this group higher and broken out as of Monday's 3/11 advance. POT stocks look bullish for further gains following Monday's rebound.The "Pot" stocks, judged by the BI Global Cannabis Competitive Peers index, which includes 99 different companies, made a sharp rebound yesterday that managed to recoup former lows and close out near the highs of the day. Additional gains look likely here to challenge the trend near 225, making this pattern out to be a triangle pattern that could offer upside in the weeks ahead, as opposed to have failed in its movement higher. Overall, i see higher prices in this group, and it's not wrong technically to consider diversifying and playing for further gains. Market selloff looks to be underway on a short-term basis as indices finally broke to join what breadth and momentum had been suggesting since 2/20. We saw a notable peak in Advance/Decline and Small-caps during that time in late February, and while S&P moved sideways, there was notable breadth erosion and a downturn in daily technical momentum indicators like MACD, not unlike what happened in September 2018.
near-term, I think pullbacks prove limited based on two factors. First, sentiment is a lot more subdued than was the case in Sept 2018. This minor pullback will put some heavy weight on sentiment, resulting in put buying and help fear elevate much more quickly than during normal peaks after a bull run. Second, breadth overall is still in very good shape since late December. Granted, the mild deterioration in breadth we've talked about in the last week IS a concern and a reason why markets are starting to turn lower. Yet the broader trend in breadth has been impressive and likely helps this dip be bought much quicker than otherwise. Overall I will be using dips to 2705-10 to cover shorts and start buying names I like technically. In addition to equities, we saw an impressive bounce in the US Dollar Thursday that adversely affected Emerging markets, commodities, and many materials names. This looks likely to continue in the short run. Charts of FXI and EEM look quite similar in starting to break down, and I think this trade has a bit of longevity in the next 1-2 weeks before it runs its course. Some charts to put these thoughts into perspective below. S&P showed the much needed follow-through to turn the trend bearish early Thursday morning, violating Monday's lows at 2772, and the violation of 2764 brought prices temporarily below 2750 before rebounding mildly into the close. The trend has turned negative, with prices managing to finish near lows of the day, and downside looks possible to near 2705-10 which represents the bottom area at the Bollinger Band on daily S&P charts, along with representing important Gann support from the recent highs. Overall, it's tough to make too much of this as anything more than a short-term correction and dips should be used to buy into early next week. Emerging market ETF (EEM) managed to followthrough on last week's trend violation along with breaking down below earlier week lows. Given the US Dollar index rising to new multi-week highs, this might put further pressure on Emerging markets in the near-term and could see EEM fall another 3-5% before this finds support. Structurally this looks to have turned bearish on Thursday's close, so it's likely that EEM weakens further in the days ahead. US Dollar index managed to exceed recent monthly highs which could help the near-term bounce extend a bit longer before stalling out and reversing lower. While the broader trend is arguably still top-like going back over the last year, the near-term trend is positive and the act of just exceeding a former monthly high likely does offer the chance to extend a bit more in the near-term. Until this reverses and turns back to give back what was gained this week, this is viewed as a bounce and will be detrimental to EM and commodities. HSCEI- No change- Expect stallout in next 1-2 days. Exhaustion signs present. Peak possible before this can get above 11890 11342 would be bearish. For now, a minor pullback can happen without disturbing bullish structure. Markets look to be beginning at least a short-term pullback, and while S&P got down to near make-or-break at 2764-7 (2767 at the time of this writing) prices haven't officially broken down just yet. However, this seems like an interesting time zone for potential trend change (as written in emails a week ago) Given that price has turned down sharply to close at the lows, and much of this selling was LED by many of the leading sectors, Transports and now Semiconductor stocks, while Small-caps, and breadth peaked between 2/20-2/22, i think its likely that a short-term pullback has begun. Much of the sentiment has also turned more positive lately, with AAII widening out nearly as wide as Investors Intelligence. When both of these start to line up with 20 point differences between bulls and bears (in either direction) it typically is worth paying attention. Wednesday brought about a fair amount of selling pressure again in Financials, while Technology sector indices like the S&P 500 Information Technology index closed at the lowest level since 2/22, it looks likely that Tech and Financials are both starting to rollover and join the recent selling pressure being seen in other sectors. GE fell 7% today, in a fairly bearish one-day pattern that bolsters the argument for further selling here after breaking its uptrend from December. (This will have a big influence on XLI) Overall, it's thought that while indices holding up while various sectors were selling off might have been a positive thing, now that SPX and other indices have pulled back to new multi-day closing lows while breadth is rolling over, markets might finally be susceptible to some selling. Bottom line, a move to new weekly lows makes it possible to see a 25-30% pullback of this prior uptrend into mid-March. However, given the breadth expansion seen, it's likely that selling proves short-lived and should pave the way for additional gains in the back half of March. One should favor owning Utilities and Energy, and Healthcare selectively, while avoiding Financials, Industrials and/or Discretionary stocks for the next 3-5 days. 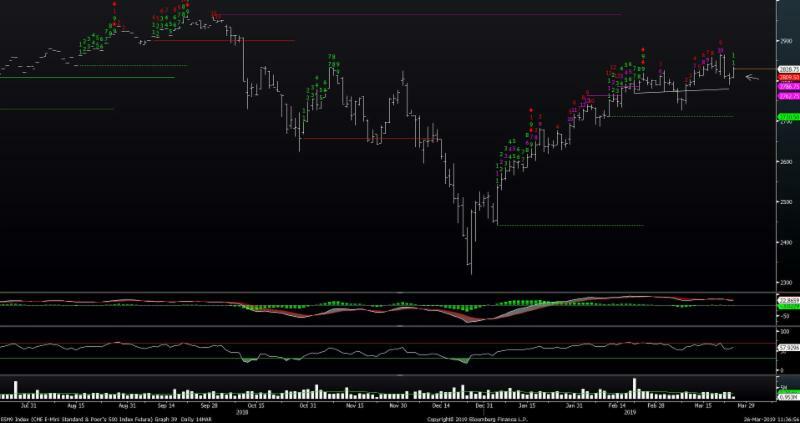 IF S&P can regain 2800, this could be incorrect, and certainly over 2816 would have to be followed and shorts covered. For now, this seems like a good risk/reward to consider hedging for at least a minor correction. S&P has broken its uptrend from late January and now rests near critical make-or-break support at 2764-7, mentioned over the last few days. While S&P has not yet broken down, the weight of the evidence supports a break given the downturn in momentum and many sectors rolling over, the downside on this go-around is likely limited to 2698-2700 with first targets near 2750 on a break of 2764. Movement back up OVER 2800 is necessary to offset some of this negative deterioration. Technology has just broken down to the lowest level in 8 days on a close. Trends have been violated, and this should be the start of at least a minor selloff in Tech. One should look at buying dips into mid-month, but until/unless Monday's highs are recaptured, it looks right to hold off on buying dips too aggressively and better to position in Utilities in the upcoming week. The near-term bearish pattern in the Philadelphia Semiconductor index itself looks to extend and something to pay attention between now and mid-month. NYSE "All Stocks" Advance/Decline looks to have made its first meaningful peak after the runup from December. While price has just moved sideways largely until yesterday's late day decline, breadth and momentum in this case might lead to a minor selloff, while breadth trends over the last month definitely seem to have been violated. So while the intermediate-term advance from December looks to extend in the months ahead, we seem to be at a juncture where at least a minor selloff could occur and breadth and momentum typically tend to lead price.